Happy Friday, and congratulations to Twila Claycomb! She’s won the Dark Hunter series. Twila, send your address to publicity@lernerbooks.com and we’ll get your books in the mail. On Sunday, the presidential election will be exactly one year away! Stock your library with nonfiction titles about elections and government with two new series that we’re giving away this week: Inside Elections and First Step Nonfiction: Exploring Government. What’s going on behind the scenes during an election? 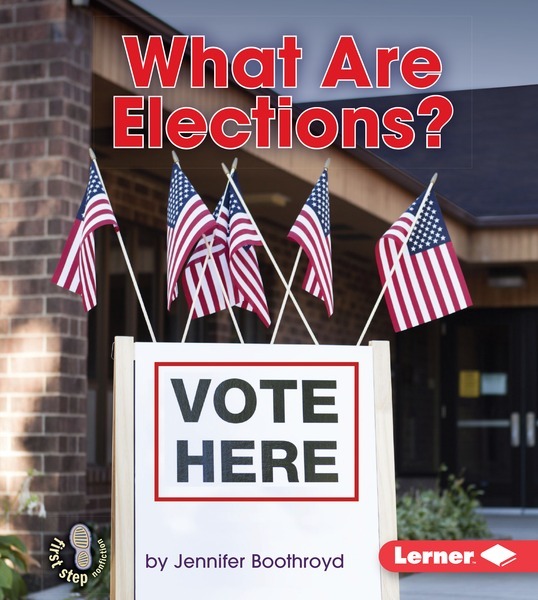 Readers will think critically about the inner workings of our political system, learning to question sources, analyze arguments, examine differing points of view, and use other media literacy skills with the new four-book Inside Elections series for students in grades 6 through 8. From elections to citizenship, the titles in First Step Nonfiction: Exploring Government help students in kindergarten through 2nd grade understand the key concepts of government. Bright, interesting photos align closely with the text on each page, helping readers decode and comprehend the sentences. If you’d like to win Inside Elections and First Step Nonfiction: Exploring Government, please leave a comment on this post (including your first and last name), or tweet this line: Free Book Friday! Tweet to win the Inside Elections and Exploring Government from @LernerBooks. bit.ly/1OrSN Make sure to check the blog next week to see if you’ve won! Responsible citizenship should start early! We will look forward to using these books in our elementary and middle school to help students see how important the voting process is in our country.